He zigged right when the party was zagging left. New York Gov. Andrew Cuomo sealed a large primary victory over progressive challenger Cynthia Nixon Thursday night. But for a man who’s long had his eye on higher office, it’s fair to say those presidential hopes are now doomed. A 30-point margin of victory (as of press time) in a primary would be extremely impressive for a professional politician running in a contested open primary against another political pro. But that’s not what was happening here. Cuomo is a two-term incumbent governor who served four years as attorney general before that, served in Bill Clinton’s Cabinet, and is the son of a man who served 20 years in statewide office from the mid-1970s to the mid-’90s. Cuomo’s opponent was best known as the co-star of (an admittedly wonderful) television show that’s been off the air for nearly 15 years. Befitting such a mismatched pairing, Cuomo also crushed Nixon in fundraising, outspending her about 20-1, and called in an unusual endorsement from the Democratic National Committee along with the support of the entire state party apparatus. Nixon had on her side, by contrast, the reality that a lot of people really hate Andrew Cuomo. And she challenged him in a year when insurgent progressives, particularly women, have performed particularly well in House primaries. But that wasn’t nearly enough for her to beat him. The fact that Cuomo had to fight at all shows pretty clearly how hopeless he’d be in a national primary, where he’d lack any of his advantages. The demographic key to Cuomo’s victory is a pattern we’ve seen before when left-wing insurgents fall short: He received overwhelming support among African-American and Latino voters. These same groups also rejected Zephyr Teachout’s campaign for attorney general, backed Hillary Clinton in 2016, and, generally speaking, do not seem impressed by white outsider/reformer candidates of any kind. But it’s not because they reject the ideology. Indeed, their stated views on economic policy issues are quite progressive. The difference is that while many white progressives have an antagonistic relationship with the Democratic Party as an institution, African-American and Latino Democrats are much more likely to think of themselves as party regulars. For example, Bernie Sanders had a 70 percent approval rating among African Americans as of a few months ago, even though he didn’t garner anywhere near that support with black voters in 2016. In other words, Cuomo’s success with voters of color isn’t particularly a sign of extraordinary infatuation with him personally or his brand of politics. Rather, he benefits from his standing as the establishment candidate — the one who is known, the one who is proven, and the one who has all the endorsements. None of this would carry over to a presidential race in which Cuomo would be squaring off against a range of other professional politicians — including at least one or two nonwhite ones — with their own set of endorsements. Something that high-information political junkies, unlike most voters, understand is that endorsements are a fairly unreliable metric of actual political sentiments. Labor unions endorsed Cuomo because he was a governor who has delivered for them on concrete priorities, even if he is actually less progressive than they would ideally prefer. National organizations like Emily’s List that would back a woman who supports abortion rights in an open race didn’t back insurgent Nixon against an incumbent. Nearly every major reliable interest group lined up behind Cuomo, and elected officials likewise fell in line. Even someone like New York Mayor Bill de Blasio, who’s been at open war with Cuomo on a number of fronts, didn’t endorse Nixon. This kind of top-down machine operates as a flywheel — more people endorsing the incumbent causes other people to endorse him. The reasons for this are practical: Even if she had won, Nixon wouldn’t have been in a position to punish those who endorsed Cuomo — there were too many of them, and she was in most cases ideologically committed to their causes — whereas Cuomo really would be in a position to retaliate against people who had crossed him. That’s a powerful tool for re-securing nomination once you’re already in office and a powerful reason why it’s so rare for incumbents to lose, but unless you’re an overwhelming frontrunner — which Cuomo certainly isn’t — it doesn’t help you win a presidential nomination. Somewhat ironically, it was actually Cuomo’s presidential aspirations that, in retrospect, have ended up dooming his presidential aspirations. His father was a liberal icon in his day, and with New York a considerably bluer-than-average state, one natural role for Cuomo to have taken early in his term would have been that of progressive champion. Cuomo was first elected in 2010, the exact same year that national Democrats lost their majorities in Congress, and his New York could have been the proving ground for the next great progressive policy agenda. But he actually had the opposite fear — that governing as a progressive in such a heavily Democratic state would push him to adopt policies that would make him unelectable in a national contest. 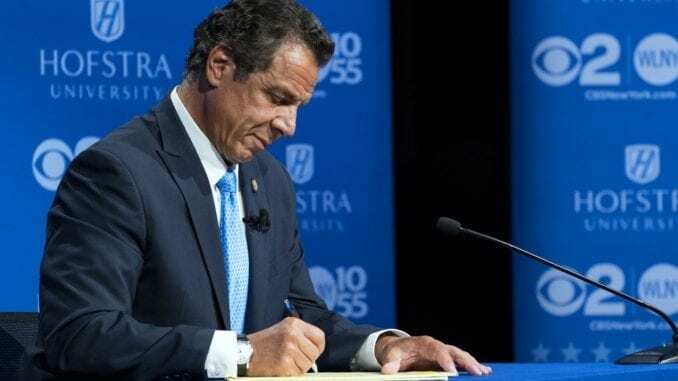 Consequently, Cuomo has consistently worked behind the scenes to keep the New York state Senate in Republican hands via the machinations of a small group of state senators who, despite winning election as Democrats, caucus with the GOP. That kept the most ambitious progressive ideas off the legislative agenda, allowing Cuomo to avoid both having overt fights with his base and endorsing policies that pushed the state substantially to the left. It was a subtle, well-executed game — subtle enough to not be understood by most voters in New York’s Democratic primaries — but in retrospect, it was too clever by half. The mood among national Democrats has swung substantially to the left over the past five years, with Barack Obama recently endorsing ideas like Medicare-for-all and employee representation on corporate boards. Had Cuomo simply done the normal thing and supported Democratic state Senate candidates and gotten the chance he feared to sign ambitious progressive bills, he’d be perfectly positioned for the circumstances of 2020. Instead, as it stands, he’s left relying on a powerful state party machine and the loyalty of less attentive voters to secure what should have been a total cakewalk of a renomination.